Other buildings were attached to houses or constructed nearby. They include toilets, barns, animal shelters, and two pig cotes. A group of three kid pens has been found, confirming that goats were kept at Y Graig. Several houses have small yards, gardens, or orchards next to them. In order to create these open areas it was often necessary to construct terraces, reinforced with retaining walls. In some places terraces were also built so that crops could be grown. 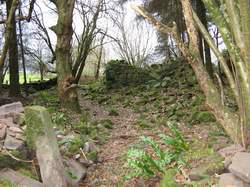 Tracks ran past several houses, with stone walls on either side whose ruined remains can still be seen. 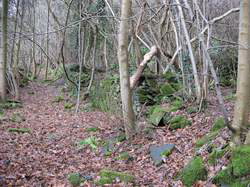 Four quarries have been found at Y Graig, from which the stone used in constructing the houses and other buildings would have been obtained. 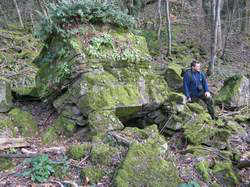 Close to the quarry at the north west end of the site are the well preserved ruins of a lime kiln. There was a brick kiln at the far south eastern end of the settlement. 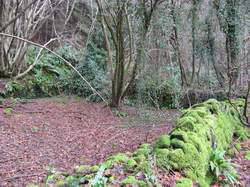 Springs emerge from the ground at various points on the hillside. There were wells and probably small ponds. It appears that the community at Y Graig was in existence by the early eighteenth century. A report in the Hereford Times in August 1855 describes in detail a court case concerning ownership of Y Graig dealt with at Monmouthshire Summer Assizes. The plaintiffs in the case, claiming to be the two owners of Y Graig, were Rev. Richard Davies and Sir Joseph Bailey. The defendants in the case, accused of trespass, were John Lloyd and one of his sons, who lived on Y Graig but refused to pay rent as they claimed to own their property. The outcome was that the jury found in favour of Davies and Bailey. According to the evidence presented on behalf of the landowners, at the beginning of the eighteenth century Y Graig had belonged to two men named Lewis and Howells. They had divided some of the land into tenements that were initially let out on 99 year leases, all of which had expired by 1805. Hereford Times, 11 August, 1855. I am grateful to Kate Ward for drawing my attention to this report. A lot of information about the state of the settlement around 1840 can be gained from the Tithe Agreement of 1842. 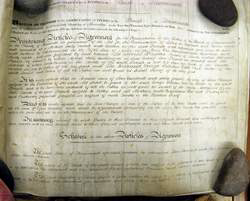 Tithe agreements had to be negotiated throughout England and Wales as a result of the Act for the Commutation of Tithes passed in 1836. Since the Middle Ages tithes had been paid in kind by parishioners for the support of their parish church and its clergy. In some places local agreements had been reached to commute payment in kind to rent but at the time of the Commutation Act most parishes still operated a system of tithes. Under the terms of the Act the tithe owner in each parish was expected to agree a system of cash rents with the landowners, and where agreement could not be reached Tithe Commissioners would set the rents. For more information on the history of tithes and the administration of the 1836 Act go to the National Archives website. In the parish of Llanwenarth the tithe owner was the rector, Rev George William Gabb. The front page of the agreement, dated 23 November 1842, is reproduced at the foot of the page. It states that after several adjournments a deal was concluded on 5 April 1838 between the rector and the landowners. A total of £460 in rent would be paid per annum by the parish as a whole. The obligations of individual landowners were listed in a schedule that accompanied the agreement. The schedule, otherwise known as the tithe apportionment, consisted of a map of the parish showing each piece of land, together with a list giving for each piece of land the name of the landowner, the name of its occupier, a description of the land and premises, its state of cultivation (usually grass, arable, or woodland), its area, and the agreed rent charge. Area sizes are listed in acres, roods, and perches, the rent charge in pounds, shillings, and pence. Copies of the agreement and the schedule can be seen in the National Library of Wales at Aberystwyth and at the Gwent Record Office in Cwmbran, Monmouthshire.